Register Log In Britbike forum Forums Bsa bulletin board BSA at Isle of Man. What were they running? I know they didn’t have much success, but I’m very curious about the bikes they raced. We’re there any 250’s racing? Were they production models or one off bikes? It would help if you would narrow your question, like what era? What class? The IOM Clubmans races were abandoned because the Gold Star was the only bike being entered according to stories being told. Hardly unsuccessful if true, and they did win most of that race category. Sorry! I should have been clearer!! Early 70s is what I was thinking. Specifically the 250 class (if they had entered a machine into that class). with a four year old bike. when he crashed at Ramsey Harpin. Phil continued the race, after several pitstops, and finished 12th at 87,37 mph. The Mead & Tomkinson B50 was on display at the BSA Inter Rally in Halls Gap a couple of months ago. It may even have been available for the right price. For the last Senior Clubman race in 1956 of the 28 entries, 16 were Gold Stars. 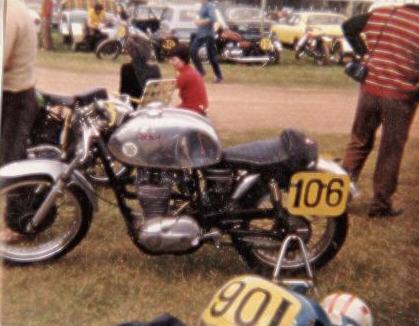 The other 12 were mostly Triumphs with maybe a couple of Nortons. The top 10 finishers were all Gold Stars except for 7th which was a Triumph. In other words the Gold Star dominated and really had no competition. Clipped from elsewhere after googling "BSA TT knife edge rocker failure", its the way I recall it, fingers burned, they didnt like the embarrassment. stayed bread and butter , later on the MC2 wasnt good enough to guarantee a victory so it never went out, according to Roland Pike it was under cooled , wouldnt last the pace. 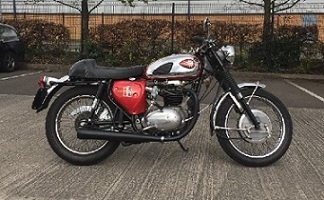 "Although BSA amassed an enviable competition record in the worlds of trials and moto-cross in the 1950s and 1960s, dominated the Clubman’ s TT with the Gold Star, and scored some notable successes in production-based circuit racing in the 1970s, it only once mounted a full works effort at the highest level. That was back in the early 1920s, when ‘highest level’ meant the Isle of Man Tourist Trophy races, acknowledged as the most demanding motorcycle competition environment in the world. BSA had first dipped a toe in TT waters in 1913, entering a team of essentially standard roadsters. For the first post-war TT of 1920 a full works effort with purpose-built racers was planned, but the prototype did not perform to expectations and BSA went back to the drawing board. The 1920 bike had employed an aluminium-alloy cylinder head with four valves, but its successor reverted to a sparsely finned, cast-iron, two-valve ’head. Convention stopped there however, for the valves – vertical rather than inclined – were opened via un-lubricated rockers pivoting on a knife-edge. While its valvegear might have caused a few raised eyebrows, the BSA’s cycle parts looked altogether more promising, the inclined engine being housed in a stylish tubular frame with sloping top tube. Although tested briefly at Brooklands, the new BSA was immediately found wanting in the steering department once practice began on the Island, resulting in a switch to a larger-diameter front wheel. Engine problems dogged the team throughout practice, and in the Senior race itself all six BSAs had retired by the end of lap two. It was an embarrassing and humiliating failure that left an indelible scar on the BSA board’s collective psyche: never again would it put the firm’s hard-won reputation at risk in the unpredictable world of racing." Last edited by gavin eisler; 01/08/19 8:59 pm. You guys are fantastic! I’m interested purely as I would love to do a sort of Isle of Man TT look to an early 70s bsa 250. Obviously it would be something that was never actually used, but I may do it anyways, as it would be a lot of fun, and I feel I would learn a ton along the way. Nothing stupid, as I don’t want to ruin a perfectly good bike, but definitely some engine mods, modding the oil return with a filter, that sort of thing. Is this a terrible idea? Alex, a couple of years ago at Mid-Ohio, a chap from Canada came down with a very fast B25 flattracker that was beating out Bultaco Astros on the half mile. 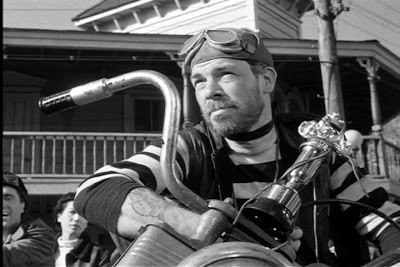 I don't know his name, but I can find out - my engine man in Syracuse said he knows of him. Could be an interesting person to talk with. Most people forget the huge competition success of the A65/70 as a sidecar outfit engine in the 60's and early 70's. I don't think most BSA guys who lived in that time have forgotten any of that. The A65-based outfits and flattrackers punched WAY above their weight for a long time, after they were supposed to be dead. Mark that would be absolutely fantastic! Would very much appreciate that!!! Thank you so much! And I had no idea about the sidecar thing. I’m very new to motorcycles (3 years), so between trying to learn my own bike, as well as the history of everything is proving to be incredibly rewarding. Ok, I'll chase that down and let you know. What province are you from? I'm pretty sure the guy I'm talking about is from Ontario. I am also from Ontario. I live in Ottawa. Thanks so much again Mark. I’ve picked up a great book written by PE Irving called Tuning for Speed. I’ve only perused it so far but there are some pretty serious things in there. From working on the inlet port, right through to balancing flywheels. It’s going to be a fascinating read. Check out Chris Vincent on Wiki. He raced BSA A10s and 65s. I was always surprised that the likes of the velocettes and ajs were not more successful. Chris Vincent is quite the man! Thanks for that. I’ve been off work sick, and this was a great topic to get engaged in this afternoon! Great sidecar racers from the 60s in UK. I remember many trips to my local road race circuit---Mallory Park. The sidecars were the most exciting races. Mostly on BSAs with a few Triumphs. On BSAs w I remember the Boddices---father Bill and son Mick (two different outfits) and then the Hanks family---Norman and his brother, Roy with their father (three separate outfits). All from Birmingham and all as per rumor getting some help from the factory--either officially or under the table. Most were on kneeler outfits but the Hanks father was very stoutly built and raced a "sit up and beg" outfit. You would see "Fatty Hanks" overtaking a kneeler on a corner man handling his outfit and sitting up there like a king on his throne. Trident, that’s a fantastic story! Thanks for sharing! It seems I was born 30 years too late!